Ask fellow campers about "Hill and Hollow Campground" and nearby attractions. Great place. The only issue I had was with the showers being on a push button and the water was not very hot. Other than that is was a great place. We camped at Hill and Hollow Campground in a Travel Trailer. Very nice campground if you're looking for something more woodsy and traditional. There are no paved roads or grass lots. All roads are gravel with lots and lots of trees everywhere. Restrooms and showers are both newer and very clean. There is an 'old' and 'new' side- the part on the west side of Business US 31 is the old side, the east is the new. The west is a little more quiet but does have the Galley Cafe and a pool. On the right day, you can have the entire pool to yourself. I recommend an east side campsite if you have kids. The reason is there are activities galore on the east side including AJ's, which has go-karts, mini-golf, game room, ice cream and a newer kids playground. If you stay on the east side you never need to cross Business US 31. 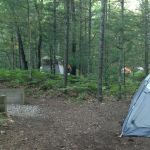 I enjoy this campground because it is a good balance between camping in the woods while having access to nice amenities and activities for the family. We camped at Hill and Hollow Campground in a Fifth Wheel. The Village of Pentwater is just a mile down the road with plenty of shops. The restaurants in the Village can get pricey and the Galley Cafe at the campground has excellent breakfast if you want to avoid the crowds and cost of downtown Pentwater. Mears State Park is a few blocks from downtown Pentwater and is a must-see for a day at the beach or just a walk along the channel and pier head. The park is very nice. Roads and most or all FHU sites are crushed rock so they are well drained but not dusty. We were here before memorial day so the rates were reduced. Site was level and wide with some shade. Sites are close but still feel private due to trees and grass between. Good satellite reception. Good Verizon LTE signal. We paid $32.00 / night for FHU with pet. Well water supply is clear and good. Seasonal and transient campers were all friendly. Park staff were all helpful and friendly. We camped at Hill and Hollow Campground in a Motorhome. We just came for a getaway weekend so we did not leave the park. There are plenty of things to do in nearby Pentwater-Ludington area. Hill and Hollow is our seasonal campground. 2015 is our 4th year staying. Our seasonal rate is $2,425 and although our home is just miles away in Pentwater this campground offers our family the feeling of being hundreds of miles away. Roads and sites are ravel. There were about 35 new campsites added this year to the east side of the park. The park is divided by Business US 31. The west side is the original 'old' side. The east is the new and also has the new sites, including a bunch of pull-throughs. Both sides have a playground and pool. The west side has a nice little outdoor cafe "The Galley Cafe". The east side has everything a little bigger and newer. Nice playground. Big pool. This campground's bathrooms are always spotless and the staff is very nice. The east side also has "AJ's", a fun park with go-carts, ice cream shop, mini-golf and arcade. My kids are ages 4, 9 & 11. They have plenty to do in this park without direct supervision of mom and dad. We camped at Hill and Hollow Campground in a Fifth Wheel. We just stayed at this campground and were happy with it. Close to town which is a plus for us because have friends who live there. We stayed on the west side campground which had plenty of shade. The campsite was a little on the small side but we squeezed in there. I would have gave a better rating but the water has tremendous amount of iron in it which they told us it was safe. Bring a lot of bottled water with you if you stay here. We camped at Hill and Hollow Campground in a Fifth Wheel. We drove up here from TN. We went from 98 degrees to 62 and we live it! The campground's heated pool was nice and warm for the 4 kids to swim in. All of the roads were safe and biker friendly. The kids loved the free games like horse shoes, and tether ball. While this does not have paved roads and cable TV, it has actual mature trees & woods. We love it here! We camped at Hill and Hollow Campground in a Travel Trailer. The campground is divided into 2 sections, 1 on each side of Highway 31. You could hear & see traffic on the sites bordering the highway. All sites were spacious, well-kept, and offered privacy with the mature trees and hills in between. We stayed prior to the Memorial Day weekend and no reservations were needed as barely any campers present. No extras at this time either (pools, restaurant, activities were closed) but price reflected this. Saw several deer in the campground. Would definitely return if in the area again. We camped at Hill and Hollow Campground in a Travel Trailer. WHAT A DEAL.... Off season rates during the week. The ONLY draw back is the area is so densely forested, it makes it hard to line up a satellite dish, as no cable is available We camped at Hill and Hollow Campground in a Fifth Wheel. We just returned from an 8 day stay at this beautiful campground. The campground is divided into two sections, "East" and "West" Park. We stayed in the east section and I cannot comment on the west as we only drove through and did not use the facilities there. There are two pools on this property. The one on our side of the campground was quite large and extremely clean. The campsite (#189) was close to the pool, store, and other amenities, yet seemed secluded because of the surrounding pine trees. The majority of the sites have semi private areas and appeared to be seasonals. Regardless, everyone we spoke to was friendly and pleasant. There is a game room on the property that is connected to an AJ's fun center that offered ice cream (must try the chocolate and coconut Eskimo Kisses), mini-golf and go karts. The go karts did run until 11pm each night, but it was not a major noise issue. At night, this campground is so quiet you literally feel like you are in the middle of nowhere. The kids had a blast and would love to go back again someday (this was 10 hours from home for us). They felt more than entertained. The campground staff were friendly without being over-bearing. The restrooms and showers were immaculate. This campground also offered free Wi-Fi, which was spotty, but you could sit up at the office on the quaint front porch and get a connection just fine. The campground also features an entrance gate and is conveniently located just north of Pentwater and Lake Michigan. I would definitely recommend it! We camped at Hill and Hollow Campground in a Travel Trailer. This is a big park. Has many seasonal campers but very well maintained. The big rig sites were level and had plenty of room. I typically do not like this kind of park, but did enjoy our stay here. The park had plenty of shade. It has two swimming pools and a great park store. You can also get propane at the store. If you have kids: they have a putt putt golf course and a go-cart track. Very close to Pentwater which ia a quaint little town. We camped at Hill and Hollow Campground in a Motorhome. Very clean restrooms, showers, and very nice pools on both sides of campground. There is a huge arcade which is great for kids and adults. We camped at Hill and Hollow Campground in a Travel Trailer. We loved this park! It is divided into 2 sections (East Park and West Park) with US 31 running between them. We stayed at the East Park. Nice-sized wooded sites with plenty of shade. Many are seasonal, and the people were all so very welcoming and friendly. (First time we ever experienced that with such a heavily seasonal park!) Two pools, one each in the East Park and West Park (although only the East Park one was in use during our stay), basketball court, really nice newer playground equipment, and of course the fun center with go karts, arcade, and mini golf. I personally did not use the restrooms, but my husband and the friends we camped with, said they were very clean. We had a nice lunch one day at the Galley Cafe in the West Park, good food and so friendly! This park is very much family-oriented and quiet, so if you're looking to party, it's not for you. The Wi-Fi is free and worked great for us. The beautiful little town of Pentwater is about 2 miles south of the campground. Don't miss the ice cream at House of Flavors! Silver Lake Sand Dunes is about 20 miles south, and Ludington is approximately 20 miles north. So much to do in the area we couldn't see/do everything. Marked down 1 rating point because there were no cable TV hookups and the second pool was not in use, otherwise this park has everything you could ask for. We will be back without a doubt! We camped at Hill and Hollow Campground in a Travel Trailer. I'm surprised that no one has ever reviewed this campground because it's a special one. While it's very quiet and wooded, it has all the amenities. Two nice swimming pools, a cafe, a go cart track at the entrance and it is just down the street from the quaint little town of Pentwter. I would have given it a 10, but the Wi-Fi was marginal, but hey, it was free. If you are looking for a quiet park by Lake Michigan with stuff for the kids or grand kids to do, this might be the one for you. We camped at Hill and Hollow Campground in a Motorhome. Are you affiliated with Hill and Hollow Campground ?